Jenna didn’t want to wear duchesse silk satin or anything with sparkles or pearls. She wanted her style to shine through. She had the denim jacket fit and re-tailored to raise the waist-band. She isn’t wearing a shirt underneath. Instead, she had custom cuffs and collar made and stitched into the jacket. So simple, yet so incredibly stylish and fabulous. And I love her pink heels! 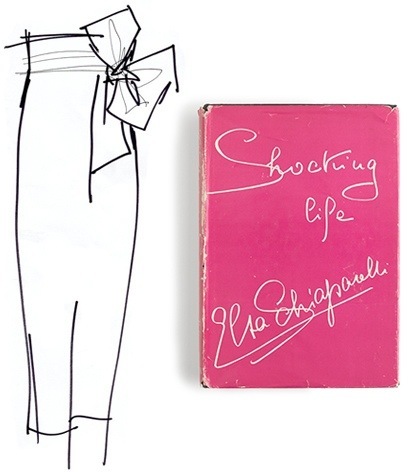 Inspired by Italian designer, Elsa Schiaparelli, Jenna sketched the skirt during a meeting (2 weeks before the ball). Honda, J. Crew’s pattern-maker, then draped and stitched the skirt right in her office. 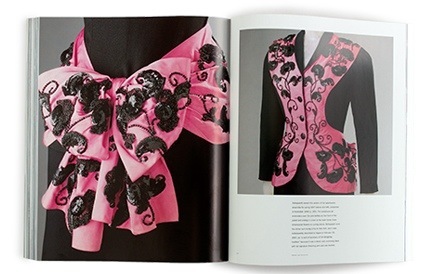 Jenna choose pink to go with Schiaparelli’s book. She also had a peplum sewn underneath the skirt because she wanted to articulate a silhouette she had seen on the pages of the autobiography. For more on the story, please check out J. Crew’s blog. 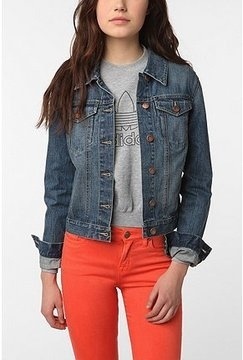 Lyons isn’t the only celebrity that does the denim jacket right. Here’s a look at some other style mavens rocking their denim. I love the wash and the fit of this style. 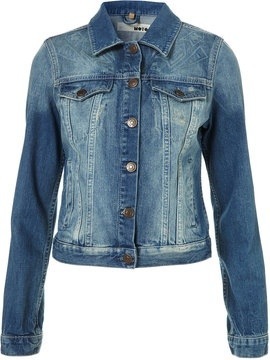 A classic looking denim jacket. This has slight distressing and looks a little vintage. 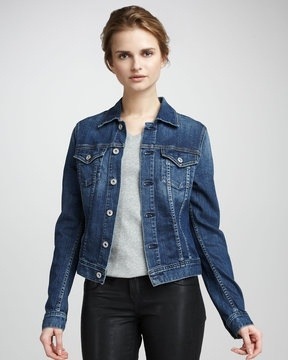 I do not condone wearing denim-on-denim by any means, but I do like the silhouette and price of this style. This style is a little over-sized and a little edgy. There are oodles of choices out there. Just remember a few things-wash, cut, and wear. A fitted jacket is more chic, choose a wash that can be worn in many different situations (no tears or rips or bleach spots), and buy a silhouette you can wear often and comfortably. And please-no denim-on-denim. I know some celebs and designers show this look, but it’s just too much.